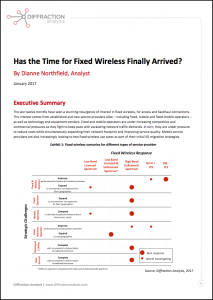 Has the Time for Fixed Wireless Finally Arrived? For a long time in the early years of Fiber Deployment we kept hearing arguments that with mobile’s evolution path it was perhaps not necessary to deploy fiber to the home. One day, mobile would deliver the same speeds at a fraction of the cost. Finally, these stories died when it became clear that 4G would not deliver that. But with 5G just around the bend (according to the most optimistic scenarios) the same stories are emerging again. And it is true that some technology evolutions like millimeter wave and meshing have improved the performance of fixed wireless propositions. As a fixed operator, and based on current technology choices, does Fixed Wireless represent a threat or an opportunity ? As a mobile operator, do these Fixed Wireless technologies enable competition with fixed operators ? How can a new entrant in the market use Fixed Wireless to accelerate deployment and acquire sizeable market shares. 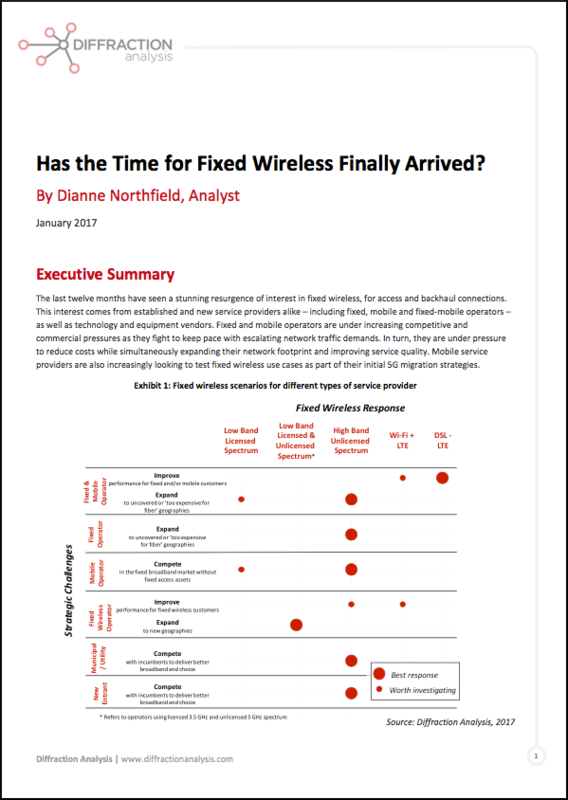 This report is vital reading for technology, strategy and regulatory people within telcos’ organisations looking to understand how Fixed Wireless may disrupt the existing Fixed market. You can buy the report directly with a credit card by clicking on the button below or get in touch for a wire transfer option. Can structural separation via spin-offs help Europe achieve its broadband ambitions? Can the New Zealand NGA Model be Replicated? Will Video Kill the Cloud Star?